How technology can be used to improve employee engagement. How businesses can use their advocacy power to uphold human rights and good ethics. How the Sustainable Development Goals (SDGs) can be used as a road map for defining long-term business goals and recalibrating the positive contributions of business to society. How businesses can deal with the rapid growth of voluntary disclosure and become a proactive force on critical issues. Despite challenging economic circumstances, the South Africa Giving 2017 report reveals that individuals in South Africa – particularly the younger generation – continue to give of their time and money to assist individuals and communities in need. 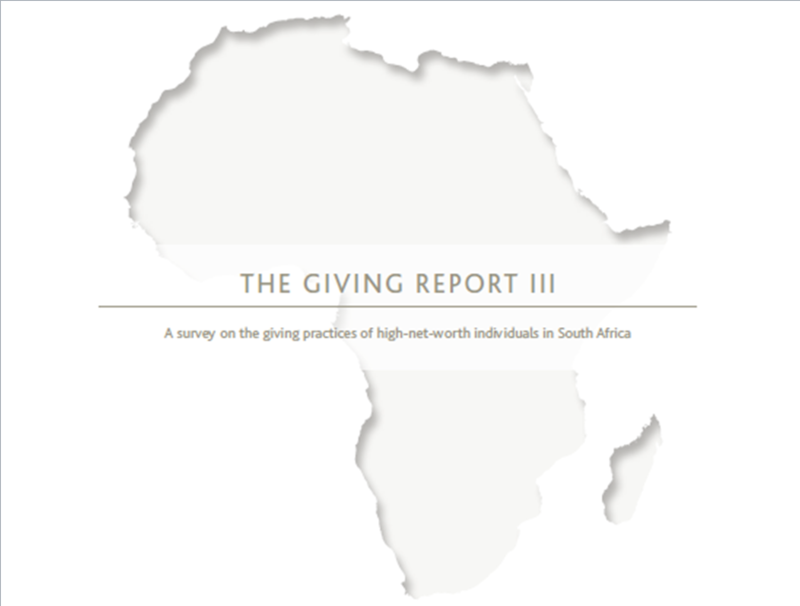 Detailing the different ways that people in South Africa donate and volunteer, this report covers how much money on average is donated by individuals, which causes people give to, how people like to give, as well as what motivates people to give. The annual CAF World Giving Index looks at how and why people around the world give to charity. It’s compiled from data from 139 countries, representing 95% of the world’s population. The report includes questions about three different types of giving behaviour -- helping a stranger, donating money, volunteering time -- and ranks each country accordingly. The Giving USA report is published annually by Giving USA Foundation, a public service initiative of The Giving Institute. It is researched and written by the Indiana University Lilly Family School of Philanthropy. The 2017 report, which covers this country’s charitable giving in the 2016 election year, provides extraordinarily promising news for nonprofits that see their givers as more than just automatic tellers. This third edition of the Nedbank Private Wealth Giving Report builds on the findings of the 2010 and 2012 research into the philanthropic commitments of South Africa’s high-net-worth (HNW) individuals. South Africa appears to be a nation of givers: over half of respondents (54%) gave money to charities or other causes, a third (31%) gave food or goods to charities or other causes, while slightly less than a fifth (17%) volunteered time for a charity or cause, in the month prior to being interviewed. In addition to giving to formalised institutions or causes, slightly less than half of respondents told us they gave money and/or goods (45% respectively) not to formal charities but directly to the poor – street children, people begging on the street and so on.